Entries from Digital Intelligence tagged with "emarketer"
Snapchat’s UK advertising revenue is set to overtake Twitter’s UK revenue in 2019, and revenue from consumer magazine and cinema advertising within two years, according to new research. The amount spent on mobile ads in the UK is forecast to reach nearly £7bn this year, accounting for 36.6% of the UK’s media ad investment by the close of the year, according to new research. Over 1.4 billion global consumers will utilize a mobile messaging application this year, and that number will rise to 2 billion by 2018, according to new research. The UK's mobile advertising market will rise by 90% this year, given the digital ad growth due to the increased use of internet on smartphones and tablets, according to new research. After coming second to Facebook in 2011, Google outsold the social network in terms of US digital display ad revenue last year, earning $2.26 billion, according to new data. Micro-blogging site Twitter is on course to make more money from mobile ads than Facebook for 2012, according to new research. The study, from eMarketer, projected revenues of $130m in mobile advertising revenues for 2012. By contrast Facebook expects to make just $73m on mobile for the year, the study found. 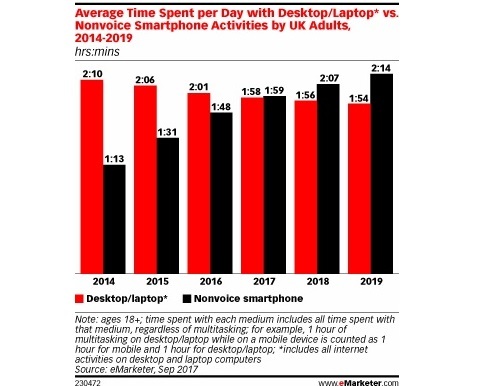 US adults currently spend more time on mobile devices each day than they do with print media, according to new reseach. The study, from eMarketer, found time spent with the internet and mobile phones was up by 7.7% and 30%, respectively, from 2010. The research also indicated that time spent watching traditional TV is also increasing, despite industry fears of online encroachment and consumer "cord-cutting." Facebook will leap over Yahoo! in US display ad revenues this year, while Google will remain the third-largest seller of display ads, with Yahoo! at No. 2, according to new report. The forecast, from eMarketer, estimates Facebook’s share of US online display ad revenues will grow to 17.7% in 2011, up from a 12.2% share last year. Global adspend is on course to reach $421bn (£255bn) during 2009 according to the latest figures from PricewaterhouseCoopers (PwC), writes eMarketer. This represents a 12.1% fall on 2008 when global adspend totalled $479bn (£291bn), according to the firm. PwC expects all advertising sectors to suffer during the year other than video game advertising. However, the firm does predict better times for digital marketing in 2010: both internet advertising (including mobile) and video game advertising are forecast to see five-year compound annual growth of 7.7% and 13.8% respectively. Globally, PwC forecasts that total media spend will rise by 2012. The world's internet population passed the 1bn user mark in December 2008, according to new data from comScore World Metrix, reports eMarketer. comScore's figure discounts users under the age of 15 and those who go online through internet cafes, mobile phones or PDAs. In contrast, eMarketer's own estimate does not discount by age or location and puts the world's online audience at 1.172bn. eMarketer's figures also predict that India will eventually overtake Germany, Japan and the US to become the world's second biggest internet country after China. eMarketer estimates that 80m web users (41% of the US internet population) visit social network websites at least once each month - an annual increase of 11%. The firm forecasts that 52% of American internet users will be regular social network visitors by 2013. In addition, as membership levels rise, users are also becoming more active. eMarketer's study predicts that 79.9m people (40% of all US users) will generate content on social networks at least once per month during 2009, either by sharing content online or communicating publicly - equivalent to 90.5% of all social network users. New figures published by eMarketer predict that the online gender balance is set to close in the next five years. The firm calculates that there were 19.5m men online in the UK against 18.6m women during 2008 (giving male users a slight 51.1% majority). However, by 2013 eMarketer expect this lead to fall to just 50.5%, driven in particular by women aged 55 and above. According to data from comScore Media Metrix for the year to November 2008, the social networks category saw the largest gains with British men, attracting 11% more unique male visitors. New research from Nielsen has found that online adspend in China grew 42% year-on-year to reach $541m in Q3, writes eMarketer. eMarketer predicts that the China's total online adspend will reach $1.4bn during 2008, up 37% on 2007. Based on the latest Q3 e-commerce data from the US Department of Commerce (DOC), eMarketer now predicts that online sales (excluding travel) will grow 7.2% year-on-year in 2008 to reach nearly $137bn. This compares to last year when online sales grew 19.8%. The firm expects that consumers will spend $30.3bn online this year during November and December - equivalent to year-on-year growth of 4%. New US figures from the IAB and PwC show that online adspend grew 15% year-on-year in the first half of 2008 to reach $11.5bn, writes ClickZ. Q2 adspend was up 13% year-on-year to $5.7bn but was down 0.3% from Q1 this year. Search revenues were up 24% to $5.1bn or 44% of all online adspend. Display advertising rose 19% to $3.8bn (33% of all online adspend). A new study by Ipsos Mendelsohn in the US has found that the average number of hours spent online increases with income, writes eMarketer. The study surveyed affluent heads of household and found that users in the highest earning tier (above $250,000) spent nearly 6 hours more online each week than those with incomes between $100,000 and $150,000. Affluent internet users who used PCs went online 25.9 times/week on average. The latest IAB US / PwC online adspend report puts total online ad revenues for 2007 at $21.2bn (£10.78bn) - up 26% on 2006's record figure, writes eMarketer. Q4 2007 revenues reached $5.9bn (£3bn) - the highest ever quarterly figure and a 24% increase year-on-year. The study found that search, display, classifieds and lead generation all continued to grow. Consumer advertisers remained the largest category representing 55% of all 2007 revenues (from 52% in 2006). Further projections from eMarketer estimate that US advertisers will spend $25.8bn (£12.9bn) online during 2008 - down from their previous forecast of $27.5bn (£13.77bn) made last October. However eMarketer predict that online is still on course to grow 23% from last year to account for 8.8% of all US adspend. Though growth is expected to slow, US online advertising is expected to reach $30bn (£15bn) next year, accounting for 10% of all US adspend. 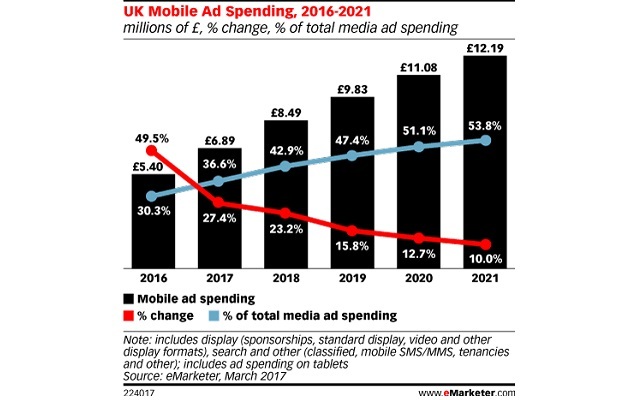 New estimates from eMarketer predict that mobile ad spend in Western Europe will grow to $3.46bn (£1.71bn) in 2011 from $382m (£189m) in 2006. Data from the European Information Technology Observatory (EITO) forecasts that the European mobile subscriber market will total 850m users by the end of 2007 and will reach 920m by 2010.